Gold and Silver Bull Market » This Week Silver and Gold Prices Actually Rose, Yes, Rose. SILVER today added 5.5 cents to $14.746 on Comex. The GOLD PRICE picked up $6.50 to $1,094.9. Since the big drop on 20 July the price of gold has spent 9 days moving sideways in a range between $1,080 and $1,104. Middle of that period the gold price dipped down to an intraday low of $1,072.30 but closed the day higher at $1,098. Today the price of gold actually eroded down to a slightly lower low than yesterday’s $1,082.50, namely $1,080.25 about 9:30. Buyers were waiting to pounce and drove gold clean up to $1,103.65 by 11:15. It backed off and spent the rest of the day twirling around $1,095. Call today a double bottom with yesterday. If so, the gold price needs not to dip lower than $1,085 and needs to climb sharply out of this pit. “Sharply” means crossing $1,104 Monday and pressing on towards $1,040 as fast as it’s skinny little yellow legs will carry it. What about the SILVER PRICE? Where are you, honey? Today silver traded down to $14.555 cents about 9:00, then shot skyward like a mortar, hit $15.01 and bounced off. Backed off the rest of the day to a low about $14.70. This leaves a double bottom with the low on Monday. Yes, yes, yes. 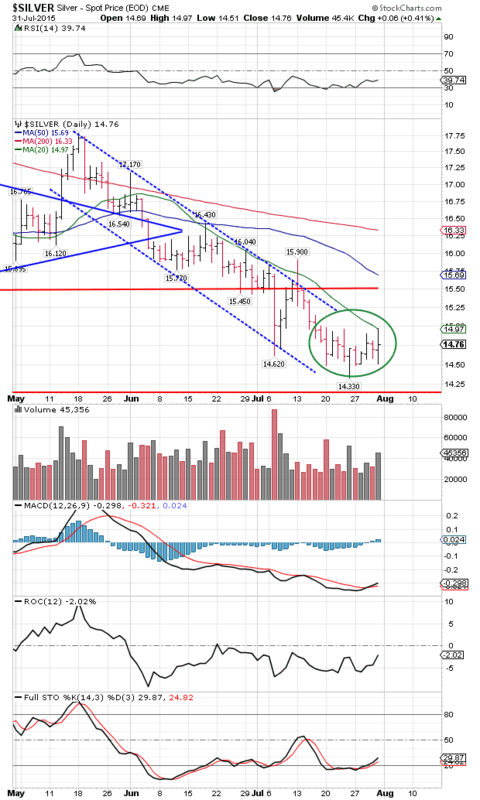 On the daily chart you can see silver and the rounding bottom it has formed. Today at its high it hit the 20 DMA — good. Milestones ahead of silver are first, $15.00, then quickly $15.50 and higher. Both silver and gold prices are set up for a hearty rally. Remember those commitment of traders show large specs short and commercials barely short, exceptionably favorable for both silver and gold prices. 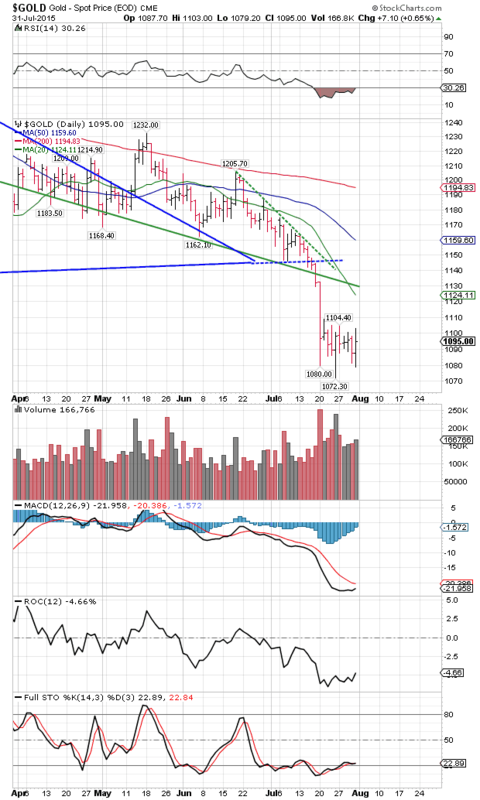 Gold’s MACD has almost turned up, silver’s has. Gold’s RSI overbought condition has nearly been worked off. If silver and gold don’t start climbing next week, I don’t know when they will. I bought silver and gold this week. After that headline claiming gold would sink to $350, y’all ought to buy some, too. Premium on US 90% coin is very high now, so high you can swap it for 100 oz bars and end with about 12% more silver. Call us at (888) 218-9226. The US dollar index gained 9 basis points, close enough to flat to call it flat. After a vicious 5 day losing streak, stocks rebounded, but began losing ground again yesterday. US dollar looked like a cartoon character today that runs into a wall, then melts down it. Dollar index at one point was down to 96.39, way below the 20 day moving average, and clean to the last low. Something/somebody pounded it on the head with a ballpeen hammer about 8:30 and down it went. Managed to climb back through the day, but closed 25 basis points (0.26%) lower at 97.44. Lots of nervous players in that market here on the last day of the month. Since it technically closed above the downtrend line, the trend remains up, but that smear on the chart looks dreadful. chart on the right. Matching the dollar performance, the Euro shot up through its 20 then its 450 DMA, only to close the day back beneath the 20 DMA. Sorry as gully dirt, even if it did rise 0.45% to $1.0983. 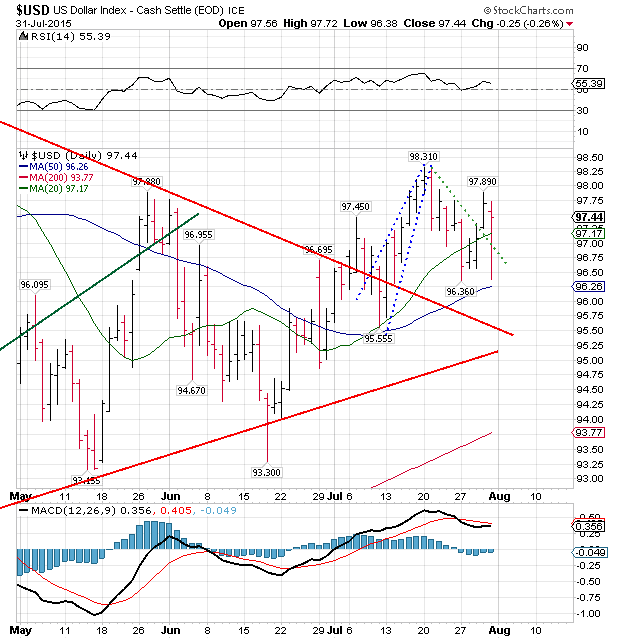 Yen also reversed yesterday’s breakdown through the uptrend line. Weird going on with currencies. Maybe Nice Government Men getting antsy about a higher dollar? Stocks ended the week higher and the month higher, barely, but are rolling over noticeably in a rounding top. Lose 600 points-make back 300 points is not a recipe for advancement. Dow today lost 56.12 (0.32%) to 17,689.86 after stalling yesterday. S&P500 gave up 4.79 (0.23%) to 2,103.84. Dow remains below 200 DMA, bad juju like those drums beating way back in the jungle in one of those old Johnny Weissmuller Tarzan movies. S&P500 diverges from the down since it is considerably higher than its 200 DMA (2,104 vs.. 2068.27) and above its 50 and 20 DMAs. Whoppin’ crash coming. Dow in gold dropped 0.96% today to 16.16 oz, and has left behind a series of lower highs. One lower low and the downtrend is complete. Behaving just as it ought if silver and gold have made a bottom and stocks turned down against gold. Dow in Silver dropped 0.72% today to 1,198.50 oz, and also shows a series of dropping peaks. Other indicators have all turned down.